Use the form below to inquire about Cozy Homestay at Madikeri . Use the form below to reserve for Cozy Homestay at Madikeri . The vibrant & green landscape around this Cozy Homestay at Madikeri seems like a whimsical land right out of a fairytale for you to explore! So, when you set out to explore the true vibes of Coorg, what better way than nesting at an accommodation with homely warmth and world-class hospitality. That is precisely what this cozy Homestay at Madikeri has to offer and here, luxury and comfort do not cost you a fortune. This abode amongst clouds is scenically set at the crown of a hill in Madikeri and offers you views of clouds, mountains, undulating roads, and a spectacular horizon filled with mist. The exterior of this enchanting property oozes class with its traditional tiled roofing and large veranda. On the veranda, lounge and unwind witnessing dreamlike vistas. A swing chair here and a hammock in the landscaped garden will take you to surreal heights. This Homestay impeccably maintains 2 contemporary styled rooms studded with all the modern comforts. The bathrooms too are indulgent and luxurious. Views of the misty Western Ghats from your private balconies are priceless. A fireplace adds colonial romance to the property and the firewood is complimentary. There is nothing cozier than a crackling fire on cold monsoon days. A well-appointed kitchen with a refrigerator, microwave, gas stove, essential utensils, and crockery is available for the use of guests. This cozy Homestay at Madikeri truly is a home recreated for you, far away from your home. A resident caretaker, backup generator, and solar heated water are services you can count on throughout your stay. At the Homestay, a complimentary breakfast is served with a lot of warmth and scintillating flavors. South Indian, continental, or Coorg ‘s local cuisine can be customized according to the guests’ palates. The welcome drink and a fruit basket on arrival add to the homely rapport shared between the guests and the host. No dearth of restaurants in the vicinity for your meals. 100%of the room tariff has to be paid within one week of Inquiry. 50% refund will be made for cancellations between 10 and 30 days, ahead of the check in date. This cozy Homestay is primarily an escape into peace and tranquillity, to rejuvenate your senses and find your inner self. But apart from kicking back and relaxing on the charming premises, guests can conveniently explore all the sightseeing spots of Madikeri since the Homestay is in the heart of Madikeri in close proximity to all the popular tourist attractions of Coorg. Plan a trip to the gorgeous Abbey Falls, the famous Omkareshwara Temple, the scenic peak at Raja’ s Seat and the historic Gaddige Monument. Iruppu Falls near Madikeri is not only wondrous to look at but is believed to wash away all your sins. The Tibetan settlement of Bylakuppe is home to the Namdhroling Monastery at Kushal Nagar with over 5,000 Buddhist monks and nuns. Cauvery Nisargadhama is a scenic island formed by the River Cauvery and offers activities like boating, elephant rides, and a kids’ park. Talacauvery is considered a sacred spot. At Dubare Elephant Camp, you can watch as well as pet elephants. At Nagarhole National Park, experience the might of the wild species of the Nilgiri Biosphere in their natural habitat. Coffee plantation tours are highly recommended while in Coorg because these enlighten every outsider who has not seen a coffee manufacturing unit. Other activities that can be tried in Coorg are bird watching, trekking, angling, and river rafting. Mysore is the nearest airport which is around 117 km (appx 2.5 hrs) from Mysore and 250 km (appx 5 hrs) from Bangalore. From Mysore, drive on NH 275 and head towards Madikeri. Just before entering Madikeri town you will arrive at Sudharshan Circle. Take the first left after this Circle. This road leads to the Homestay. 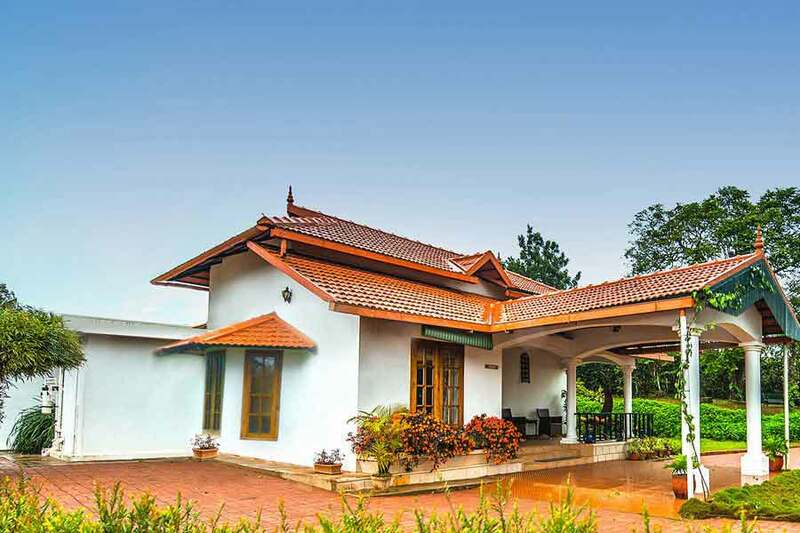 A beautiful and quaint Kodava bungalow, located in Madikeri town in Kodagu. It has two bedrooms with attached bath. Well furnished with all the basic amenities to make your stay comfortable. It is very well located as it is right in town yet away from the hustle and bustle. Tourist spots are in close proximity and you can plan your sightseeing easily. A bed and breakfast concept. Lunch and dinner can be eaten out. Madikeri town has quite a few restaurants offering local and other kinds of cuisines as well. Excellent hosts who are extremely warm. Hospitality at its best.